Anguilla is a small island located in the British West Indies. It is the most northerly of the Leeward Islands in the lesser Antilles and directly north of Saint Martin. The island is only 16 miles long with a capital called The Valley. There are various ways to get to Anguilla. After flying into Saint Martin, we took a 2-minute taxi ride to a dock literally across from the airport. From here we boarded a shared boat which took us on a 25- minute ride across the channel. Since everyone on the boat arrived at the dock when we did, the boat departed 30 minutes early! The waters were a bit rough but the ride was quick. An alternate way to travel is a 7-minute flight, however, these are scheduled flights so they don’t depart early. Private boat or plane charters are also available. After clearing customs in about 10 minutes and a quick taxi ride, we arrived at Cap Juluca. WOW is really the only word to describe this gorgeous paradise! Cap Juluca is a slice of Caribbean heaven. After a recent $130 million refurbishment, the resort is modern, pretty and comfortable. The 108 rooms are housed in white washed buildings all reflecting a refined Moorish style of architecture and décor. We were thrilled when we walked into Villa 6 Casablanca, our home for the week. This is by far one of the nicest rooms I have ever stayed in- with two bedrooms, three full bathrooms, a living/dining room, our own pool, a Villa butler, and our own personal golf cart. The best part of the room, however, was its location. Villa 6 Casablanca sits about 50 feet from the beach providing easy access to the sand, ocean and a spectacular view! Everything about Cap Juluca is refined, understated elegance and aims to provide incredible service for its guest. My kids were thrilled we had our own golf cart but bikes were also available for guest staying in the rooms at the far end of the beach. The three outstanding restaurants were delicious, Maunday’s Club located by the lobby and Pimms and Cip’s by Cipriani occupying a spectacular spot on a point by the water’s edge. Maunday’s Club offers an excellent lunch; guests eat overlooking the beach as well as the green tiled pool. At night, this is a great spot to have a cocktail and listen to some live calypso music. At Pimms and Cip’s by Cipriani guests eat with not only breathtaking views of the ocean but also views of the entire beach and resort. 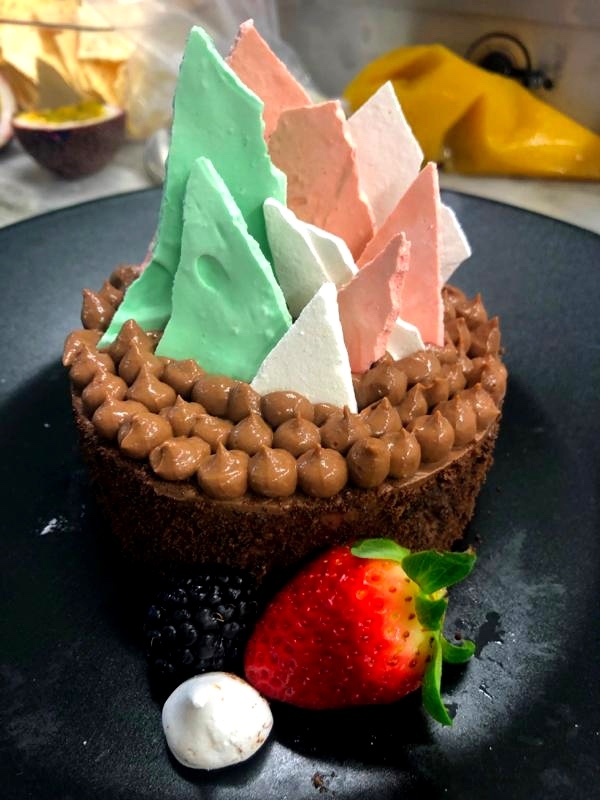 The Moorish theme resonates throughout the restaurants with whitewashed walls, arches framing picturesque views of the beach, and a stylish bar area decorated with beautiful green tiles and cool chandeliers. While the restaurants themselves are pretty and inviting and the food was excellent, it was the pastry chef who won our hearts. As she has done in the past, my daughter was fortunate to spend not one morning but three in the Cip’s/ Pimms kitchen with Kika, a pastry chef from Croatia working at Cap Juluca. OMG… the desserts they made- chocolate cake, chocolate soufflé, cookies, tiramisu, meringues and macaroons. While the desserts were fabulous, Kika was amazing. Her guidance and kindness with Katherine in the kitchen was phenomenal. What an amazing treat and experience for my daughter! For guests who are looking for alternative activities other than just recharging on the beach (or in my daughter’s case baking! ), the resort offers a gym, Arawak spa, tennis (which we took advantage of), a basketball court, snorkeling and scuba, tubing and other water sports. Since our room had its own pool, we never visited the gorgeous, green tiled infinity pool; the daybeds surrounding it looked heavenly. 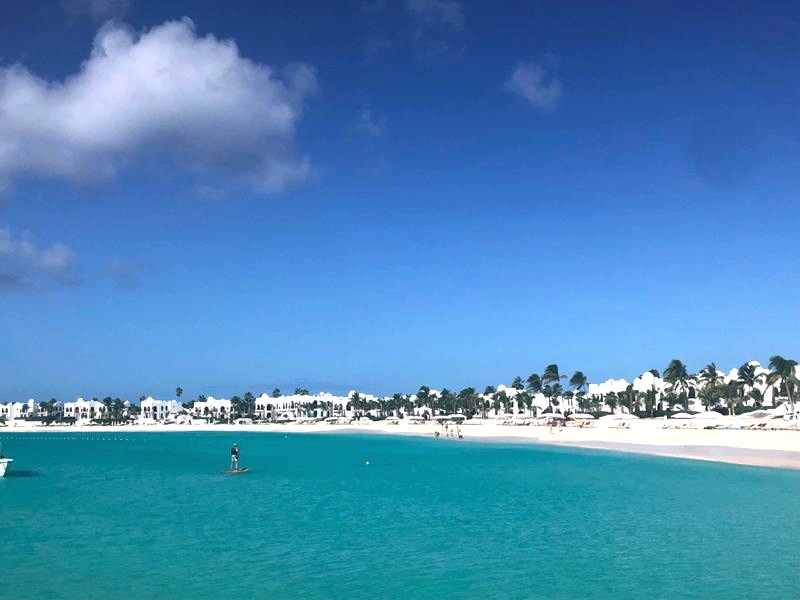 But the true gem of Cap Juluca is the stunning beach where we spent endless hours taking in the sun and healing Caribbean waters. Belmond Cap Juluca won our hearts on this trip. We are counting the days until we can return. For anyone looking for an understated, refined, elegant beach spot this is the place for you. The attentive staff, calming atmosphere and beautiful beach will help any guest recharge, relaxing and enjoy the beauty of Anguilla.